CSULB in Long Beach August 7, 2018. File photo by Thomas R Cordova. Police are looking for two armed robbers who held up a 7-Eleven convenience store near Cal State Long Beach while another person waited in a getaway car early Saturday morning before crashing on the CSULB campus and fleeing, authorities said. 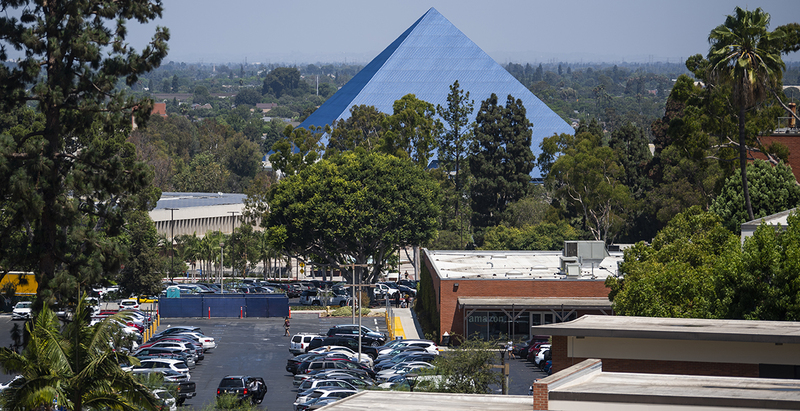 University Police sent an alert to CSULB students to shelter in place while they searched for the three robbers for two to three hours, Capt. Rick Goodwin said. The robbers, wearing dark clothing, held up the store using a short-barreled shotgun and a knife shortly before 2:30 a.m., Goodwin said. The store reported about $200 was stolen. A University Police officer was driving by the 7-Eleven on Palo Verde Avenue and saw the two robbers flee into a car parked on East Atherton Street. “The officer gave chase and the suspects drove through campus, winding up at Parkside (dorms) and crashed their car right into what appeared to be a newsstand,” Goodwin said. The three robbers jumped out of the car and ran out of sight by the time police got there, he said. Assisted by Long Beach Police Department officers and Veterans Hospital police, officers searched the area until about 5 a.m. when they lifted the shelter-in-place order. “No one reported seeing the suspects run into the dorms,” Goodwin said. The three robbers are still outstanding and the incident is still under investigation. The robbers’ car is now in University Police custody.